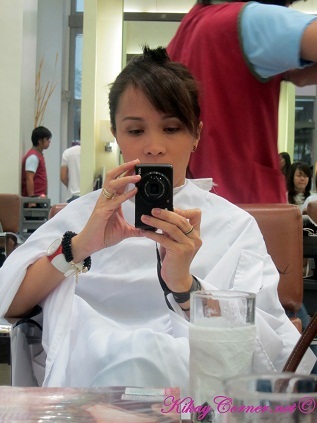 My overly fried tresses finally got the snipping that they needed at Henri Calayag Salon last Wednesday. Good thing I was finally able to squeeze that in my schedule. Even the L’Oreal Power Dose treatment I had done a couple of weeks back at another salon barely did anything to my hair. I just got really tired of not being able to brush down to the ends because of the stubborn split ends. Yes, my hair is that bad! If it was not for the L’Oreal Nature Anti Frizz serum which I use interchangeably with Citre Shine No Frizz serum, on a daily basis, my hair would never look half presentable. 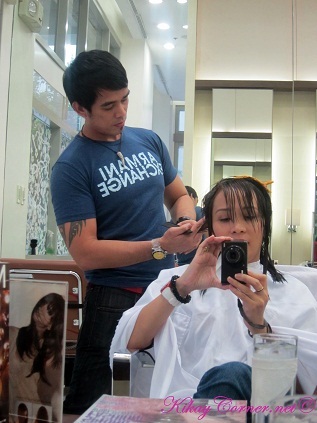 So early last Wednesday, I called up Henri Calayag Salon for an appointment later that day. I asked for a Senior stylist. Since I was told that Henri is not around for the day. I wouldn’t want a mistake done on my already damaged hair. Henri’s next man being, Richard, who I was told was the salon’s Junior Creative Director. He, as I understand, comes next to Henri. As expected, I got the affirmation that my hair is in really bad shape and I should forget about rebonding altogether. I assured Richard that never again will I have that done. I’ve seen enough how bad my hair turned out. He would not even recommend digital perming even in the near future. All I wanted was to get my hair restored. So I was told to come back after a few weeks (since I just had power dose treatment done recently) for a round of Kerastase treatment. Then, if I was at all to consider another treatment, it should be no more than a Keratin Complex Smoothing Therapy which is better known as Permanent Blow Dry. I remember almost purchasing that deal in one of those group buying sites. But had second thoughts because it was gonna be done in a salon that I have never heard of. Since my issue is just to have manageable hair, ideally, the wash and wear kind, I think this is it for me. The rebonding tends to flat out the hair and is not exactly my favorite. Poor alternative for my rather out of sorts naturally wavy hair. Richard emphasized a few more times never to get my hair rebonded again. Else, I might just find my hair falling out altogether. Yikes!